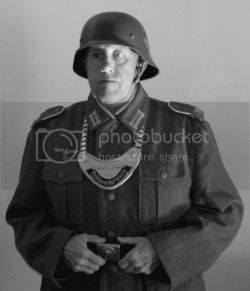 wwii axis reenactment forum • View topic - Correct Early War East Front Armbands? Correct Early War East Front Armbands? Post subject: Correct Early War East Front Armbands? would this type/style be correct for early war period on eastern front? 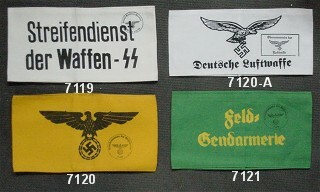 Post subject: Re: Correct Early War East Front Armbands? You want the cuff title for FG proper, or the green armband for auxiliaries. so I guess that Green armband is what I need? Anyone know a vendor? If you are portraying an Fg and not an auxillary, cuff title and arm eagle would be correct. Lightly tacked on for quick removal should the Bolsheviks get a little too close and you feel the need to blend in. I only wear my Feldgendarmerie gear while the unit is gone from camp. All I do is just put on the Gorget. I just did not know if I really needed an armband to be more period correct or not?